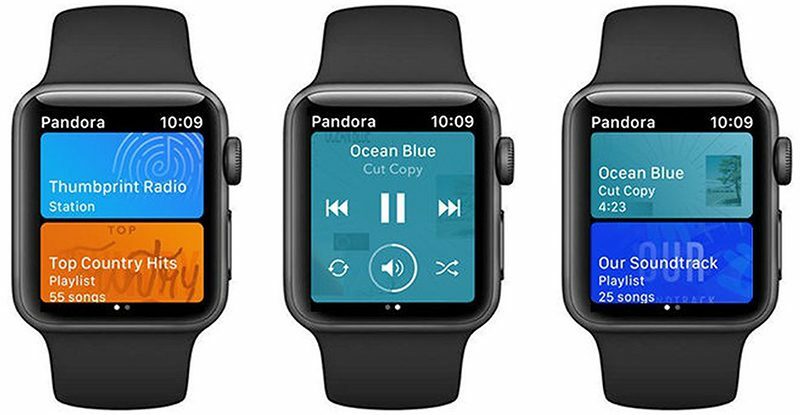 Pandora today launched an updated version of its iOS app, which includes a redesigned Apple Watch experience with features that Pandora users have been requesting. Pandora built its new Apple Watch app from the ground up with features that include remote access playback, the option to favorite songs right from the Now Playing screen, and, most importantly, offline playback. Apple Watch owners who use Pandora will be able to listen to the streaming music service without an internet connection. There is a catch though -- using Pandora sans internet requires a Pandora Plus or Premium subscription. Pandora Plus is priced at $4.99 per month, while Pandora Premium is $9.99 per month. Pandora Plus offers up unlimited personalized stations, unlimited skips and replays, four stations for offline listening, and no ads. Pandora Premium, though, allows users to search for music and play any song, as well as create custom playlists and download any music for offline listening. As The Verge points out, Pandora users will not be able to stream music with an Apple Watch's cellular data connection, a feature limited to Apple Music. To use the new Pandora Apple Watch app, Apple Watch owners will need to have the latest version of watchOS, watchOS 5, installed. Spotify needs to hurry up and do the same thing. watchOS is hamstrung just like audioOS on HomePod. LAME. I'm surprised that Apple even allows other music sources. If they didn’t, it would be a big mistake. Not only would they probably get hit with anti-competition lawsuits, but they’d probably lose a lot of customers to Android. It’s not like they don’t allow alternatives like email clients, browsers, cloud clients, etc. You could also have T Mobile. Since they give free Pandora Plus. Great to see this but I’m still pissed that Pandora removed their app from Toyota Entune on my Prius Prime. That wasn’t cool. Gave. That offer is over as far as I know.